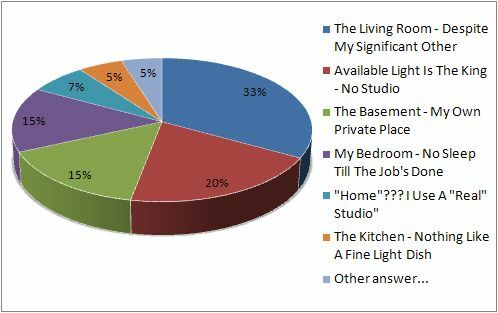 About a week ago, I asked DIYP readers where do they take most of their studio pictures. 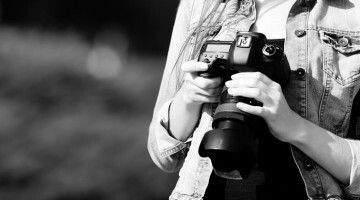 The matter of setting up a home studio is strongly related to having a place to set the studio at. We’ve all seen how a studio can be set up in under three minutes (ok, timelapse cheating, but still), so it was interesting to learn how DIYP readers coped with this issue. Full results and some thoughts after the jump. We had about 430 votes on this question, which was really nice as this was the first ever poll here at DIYP. So thanks to everyone who voted. I expected the living room to be the top dog on this one – 33%. It is usually the biggest room in the house, and for photographing any “non product” picture size matters. (And I don’t care what they tell you). I was a bit surprised to learn that a huge part of DIYP readers (at least the active ones) are shooting available light only. It’s not that you can’t get amazing results with available light, however, it does limit you in so many ways. Basement comes in third with 15%. This is a huge number considering that not everyone has a basement. Basements are cool for shooting – they are big, isolated and can bare the unbelievable mess temporary objects displacement that usually accompany a studio. I’ll be moving places in a week and I plan to use the basement for my studio needs. Bedroom with 15% again was another surprise. Not cuz I don’t think it is a good place, but I’m thinking that if you used the bedroom for shooting enough times, you’ll end up needing a smaller bed and then, you’ll really have enough space to take your shots. 7% have a real studio (oh, the envy), another 5% use the kitchen and the last 5% use all kinds of others: Sauna and Party room, forest and Wherever I have space for a lightstand were some great answers. Garage was another common answer on the “other” section. As I said just a minute ago, I’m moving places next week, and I’m spending this week putting my life into little boxes. The next installment of S@H that deals with lighting will have to wait a bit till I at least start to unpack.